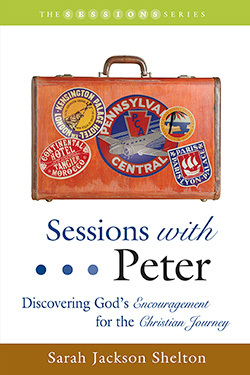 Sessions with Peter is a ten-lesson study unit designed to provide a compelling study of 1 and 2 Peter. Each session is followed by exercises for spiritual reflection that allow for a deeper experience of the scriptural passages. These exercises can be used by seminar leaders during preparation and group discussion, as well as in individual Bible study. Sarah Jackson Shelton takes readers on a journey through Peter’s letters to the churches in exile. Through these sessions, Shelton connects today’s readers of these passages to the tangible encouragement that these letters offer. Just like the example of Jesus, Peter reminds us that our call is to be found faithful to God’s grace in spite of persecution, temptation, alienation, or social oppression. As it was to its original audience, Peter’s encouragement for us to stay true to our Christian beliefs is a welcome drink of cold water in what can often seem a spiritual desert. Sarah Jackson Shelton is the senior pastor of Baptist Church of the Covenant in Birmingham, Alabama. She is a graduate of the University of Alabama and Southern Baptist Theological Seminary. Sarah, and her husband Lloyd, find great joy in their two sons, David and Dannelly. The Sessions Series editor is Michael D. McCullar.